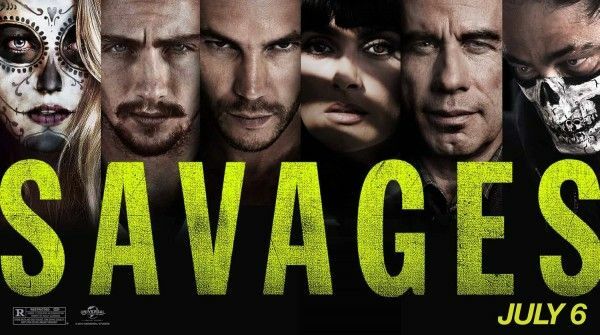 Today, we’re happy to premiere an exclusive featurette for Oliver Stone‘s upcoming crime-thriller Savages. The film stars Taylor Kitsch and Aaron Johnson as two pot dealers who must rescue their shared girlfriend (Blake Lively) from Mexican cartel runners (Salma Hayek and Benicio Del Toro). In this exclusive featurette, we meet the film’s DEA Consultant/Advisor Eddie Follis, and we also get a look at John Travolta‘s character, DEA Agent Dennis Cain. Hit the jump to check out the featurette. Savages opens July 6th. Laguna Beach entrepreneurs Ben (Johnson), a peaceful and charitable marijuana producer, and his closest friend Chon (Kitsch), a former Navy SEAL and ex-mercenary, run a lucrative, homegrown industry—raising some of the best weed ever developed. They also share a one-of-a-kind love with the extraordinary beauty Ophelia (Lively). Life is idyllic in their Southern California town…until the Mexican Baja Cartel decides to move in and demands that the trio partners with them.